The large commercial hub in Pakistan with all the modern facilities of life, business centers, air networks, latest infrastructure and all sorts of hotels is no doubt its capital Islamabad. Islamabad is one of the most well planned cities in the world located at the foot of Margalla hills and attracted people from all over the world because of its natural green beauty and luxurious residential life. The developed capital and the ancient city of Rawalpindi stand side by side and named as twin cities. 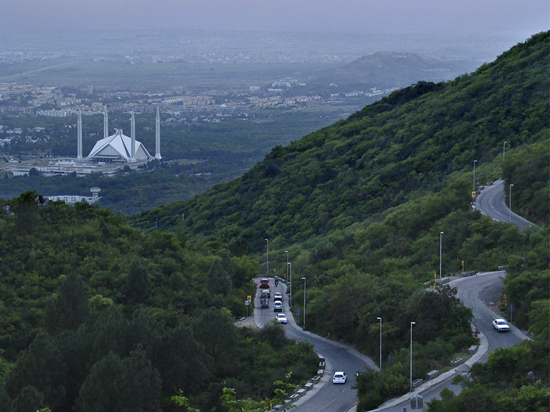 Islamabad is the most developed city in Pakistan and is known as Gamma- World city. The city possess many attractive places like Faisal Mosque, the largest mosque in South Asia, Daman-i-Koh, Margalla Zoo, Pakistan Monument and Rawal lake view point. Besides many shoping malls and markerts are there for tourists. Islamabad known as the Green City has a large number of resorts and hotels with gurantee facilities. Tourists from all over the world book hotels in Islamabad and enjoy luxirious living.These hotel provides a relax atmosphere after a long journey. Most requested hotels in Islamabad are Marriott Hotel Islamabad, Sheraton hotel Islamabad , Islamabad Hotel Islamabad, Centaurus Hotel Islamabad and Best Western Hotel Islamabad. In these hotels local traditions are combined with latest technologies to provide a comfortable stay to their honourable guests. The Serena Hotel in Islamabad is special for executive class and meets all needs of the businessmen.This hotel stands on fourteen acres of land, with beautiful gardens and serene water shore of the Rawal Lake in close proximity, next to the Diplomatic Enclave. The twin city Rawalpindi also possesses a well known hotel, Pearl Continental Hotel Rawalpindi. Pearl Continental Hotel Rawalpindi enjoys the status of the only deluxe hotel in the city with gracious hospitality. Along with luxirious hotels, cheap hotels in Islamabad also have their importance.These are Envoy continental Islamabad Hotel, Hotel Margla Islamabad ,Avari Xpress Islamabad, Hotel Ambassador Islamabad and many more. These Islamabad Hotels provide fine hospitality and meet all needs of tourists. Cresset Travel and Tours has contracted rates with most of these hotels of Pakistan.So to enjoy the the beauty and greenry of Islamabad you should waste no time and book Cheap Hotels in Islamabad.